In the mid-1980s, thanks to an Argentinian contact, i was able to acquire most of the collected works of Uruguay's musically brilliant answer to the Fab Four — Los Shakers. That coup subsequently put me on a bit of a global quest: Whenever i would visit a foreign land, my goal was to purchase recordings by that nation's equivalent of the Beatles. That meant every trip to Montreal secured me armloads of Les Sultans records, excursions to Spain landed me several Los Brincos discs, i helped myself to a smorgasbord of Tages music in Sweden, even my visit to Istanbul entailed smuggling back, Midnight Express style, recordings by Mavi Işıklar (OK, it wasn't quite like that, but let me have my fantasies). Yet it was in the faraway and exotic locale of Greenpoint, a Polish enclave in Brooklyn, that i first came face to face with Czerwone Gitary — Gdańsk's finest purveyors of beat, as exemplified by the band's slogan: "We play and sing the loudest in Poland." Czerwone Gitary — their name translates as "The Red Guitars" — formed in that seaport city in 1965. Like their Liverpool musical counterparts receiving American R&B from seamen during their formative years, for Czerwone Gitary being located dockside meant exposure to music otherwise unavailable to other Soviet Bloc musicians. One listen to the five-piece combo's debut LP, 1966's To właśnie my, makes it evident whose records the Polish sailors were slipping to the band members. Recording exclusively original numbers that ranged from bouncy rockers to keenly harmonized ballads, every Moptop move is represented in spades. But unlike most foreign Fabs, they seemed to be only one year behind their role models' sonic innovations. And though the band's name alludes to their status as a rock group based behind the Iron Curtain, Czerwone Gitary's lyrics aren't exactly the Communist Manifesto. In fact, judging by the titles, their songs don't seem to be about much at all. Imagine Jerzy, Krzysztof, Bernard, Seweryn and the other Jerzy shaking their mopheads while serenading us with "Pięciu nas jest" ("There are five of us") or the title track ("Here we are"), and you realize that not having anything to sing about is no reason to clam up. And when the words do mean something, it's still a head-scratcher. While by 1966, the Beatles themselves were learning how to spell THC and LSD, the Czerwone crew evidently broke into the local vodka distillery to achieve the same effects. The recorded proof is their song "Bo ty się boisz myszy" ("Because you are afraid of mice"), a silly romp that they giggle their way through. Suffice to say they became Beatles big in Poland, touring all the spots the Beatles couldn't, such as Czechoslovakia, East Germany and the Soviet Union. 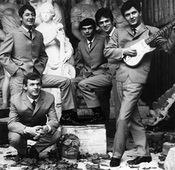 Czerwone Gitary have carried on for 43 years and more than 80 albums, later adopting a folk-pop direction in the '70s. They still perform today, with three original members: guitarist Jerzy Kossela, drummer Jerzy Skrzypczyk and founding member Henryk Zomerski on bass. I was briefly dating a Polish immigrant a couple of years ago. Once I asked what she & her fellow immigrant friends did on girls' night out the previous night, and she said, "Oh we went to see Czerwone Gitary, the Polish Beatles, they played at a hall here (Philadelphia) last night. Didn't think you'd be interested..."
ARRGGGHHH!!! Did I mention we USED to date..? I can't believe I missed these guys. On the plus end, she did give me a CD of theirs on my b-day. Yeah, and we have our Elvis Presley too, namely Krzysztof Krawczyk. Regards from Poland. My name is Awie from Jakarta, Indonesia..
bro, you have this mp3 songs "najpiekniejsza"? Please upload it, if you have it? When this song was recorded? I cannot speak polish language, but this song is very cool song..